If you’re a fan of detailed architecture and carvings, then there is a place in Bagan which will treat the art lover in you. The Htilominlo Pahto is a great attraction which is considered to be a hidden gem in Bagan. The stunning statues and out of this world paintings which grace the walls and ceilings, make your visit all worth it! A perfect place to watch sunset and witness the moon rise over. Don’t forget to carry your camera as this place has a lot to offer when it comes to photographic opportunities. How popular is Htilominlo Pahto? People normally club together Tharabar Gate and Ananda Ok Kyaung while planning their visit to Htilominlo Pahto. It is worth the visit for its grandeur and sanctity. Beautiful 4 Buddha statues facing 4 different directions. 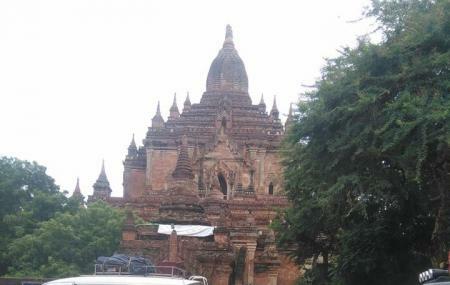 Gets crowded though, compared to other also beautiful sights in Bagan where you can enjoy peaceful atmosphere. Htilominlo temple is named after the king in whose reign it was built. It is said that it is built on the site where he was chosen to be the king. The best place to start one's pilgrimage in this temple city of Bagan, it is a beautiful three storeyed structure of red brick. There are four statues of Buddha facing four directions . The effects of an earthquake are evident here. But its sanctity is still intact. I enjoy to visit there. Nice to visit. Pagoda was lovely to see and there's a good range of products on the stalls outside.